Hope your holiday was good! Love your shows, but I find them, sometimes, to be too long to watch. 1:17 is a bit extreme. YES I try watching 15-20 min as schedule allows, but it’s difficult to find where I left off, etc. Could you pause, stop at say. . . 25 min, then start another episode? You’d have 3 episodes out of this one, or is it time & cost prohibitive? I’ll mark this one to watch in the evening sometime. The festive season has been good thanks. Hope you had an enjoyable holidays too. 1/ turning out 2 or 3 episodes for the same amount of footage is more time consuming in post production – each episode involves editing, colour grading, audio mixing, adding images and titles, then video compression, uploading, writing titles, notes, links and endcards in separate video uploads on YouTube, adding meta data and images to podcast audio files, uploading to audio file host and Soundcloud (again with added notes and image), then linking everything up on a page here on my blog, adding an embedded video and adding an audio player linked to the audio file hosted elsewhere. Then sending out notifications of the publishing of the episode via social media and email. So, yes it is a considerable amount of work just making one episode, never mind three. 2/ That said, a while ago I did ask viewers and listeners to let me know what they preferred – shorter sessions with fewer questions, or the current format with 5-7 questions and me taking as long as necessary to answer them. The vast majority said “keep it as it is”, particularly from the podcast listeners, who form the majority of consumers of these shows. More people listen than watch. 3/ If I could find a sponsor for these shows to bring in some income to justify the time involved, then maybe I could justify the time (or the expense of paying someone else) to turn out more episodes. Until then, I can only justify making at most one episode per week. I do not every find you to be snickety, if anything, I see you as coming across as humble and wise. Although I think I might add snickety to my daily vocabulary, I LIKE that word, lol. Perhaps it is I who needs to conform a little. I had never considered just listening to the podcast. If I do that, I can listen during my commute to work and accomplish twice as much by multitasking! Wonderful idea there. With that in mind, DON’T CHANGE A THING. I knew there was time involved with the production side of it, but Geesh. . . didn’t think there was that much extra. It must take you the better part of a day just to produce 1 hr worth of YouTube. THANK YOU for your efforts. If you have a smart phone, you can subscribe to AskPaulKirtley in podcast form, which allows you to pause and resume as needed, and listen whilst doing other things – there are rarely visuals which are essential to understanding the answers. Hope that helps. Best wishes for the New Year to you, Paul and everyone else on the comments section. Thanks for your reply to my reply. It made me smile. During a commute or travel in general is certainly a popular way to consume the #AskPaulKirtley podcasts. Also, if you have somehow missed the Paul Kirtley Podcasts, which is available only as audio, then you should also add these to your commuting playlist. 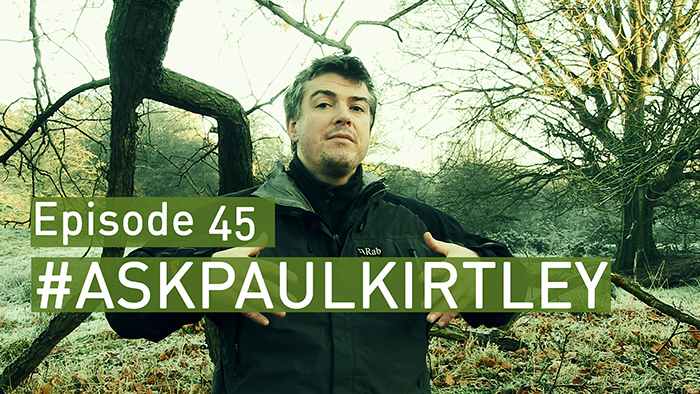 Let me know how you get on integrating the podcasts with your commute, and which you prefer for the #AskPaulKirtley shows – video or audio. A great and informative episode again. Thanks for sharing your knowledge and your opinions. Happy New Year Mr. Kirtley. Best wishes to you and yours. Im based in the UK but I have stumbled across a great resource for wild edibles on youtube. I believe the chap is based in florida, so Daniel may find it useful information to pass on to his children if he finds it suitable. I’ve found this useful even in the uk, so I’d imagen this would be a great resource in Florida. Reference taking a flame to make a fire I totally agree with you. I’ve been involved with scouting for some 54 years and I wish the skill base was expanding. Prior 1965 the 2nd class test was to light a fire with use of two matches only. This of course ensured you kept your matches dry,your fire lay was good(sleeping with kindling in the tent), and the continuing layers of fuel were prepared ready to go on. No fire, no cooking, no breakfast in those days. No gas stoves available. Only last week watching an Explorer scout trying to light a 400mm diameter log with a turbo lighter was sad but amusing, after the failure his leader gave him another lighter!. I had to stop it there and just chopped the log up in to smaller pieces , and made a few feather sticks , cotton ball(cheat) and ferro rod spark. Sadly scouting in the UK is no longer skills based but a participation experience?Where before they had to learn tree ID and the burning value of woods, knife and axe craft. But it just proves what you have said is correct it is a culmination of skills that gets success. May I wish you once again a Happy & Prosperous New Year. It definitely is a culmination of skills, brought to use in an intelligent way, which brings success with them. Hi Paul. Happy new year mate. A very big thank you for all your hard work over the year, I’m always keen to see your take on thing’s and to hear your opinion . Having the opportunity to pick your brains on ask Paul Kirtley means an awful lot me and the fact that you take the time and effort to share you wisdom for free is a testament to your character. All the very best Adrian. Ps, with all due respect sir, that was a rant and a half. even I needed a whiskey after that one. Pps, internet trolls have nothing better to do with there time than waste other peoples. May your time be filled better thing’s. Ppps, My new year bushcraft resolution is, to improve my plant identification. Ie, to see the progress of certain plants through the year. PS I’m sure I can manage a better rant than that. Hi Paul. Message received and understood. Will kick brain into gear and conjure some questions for bushcraft demistification. Apologies for mistakes and missing words in previous post. Predictive text is a bane of mine. Wood Badge and experience are the only training for Scout Masters that I know of here in the USA. Of course right now there is more concern about a person’s background than there is about their skills. I have been now twenty years separated though, from scouting. Hi Paul, and happy new year. Great questions on your channel askPaulKirley and focusing on leather belt kit question I have to say that water bottle and kit pouch carryed on leather belt are really annoing to my back when wearing a normal sized backpack so, some time ago I experimented to wear leather belt across my chest(diagonally), instead aroung my waist and it works really fine. Just per say. My new year bushcraft target is refine carving . Happy New Year Pierluigi. As always, thanks for your comments. Hope you had a happy new year and may it continue. Skills for 9 year old. I’m a firm believer in first aid so would always say that. My children were taught safe knife practice at around that age. It made them feel grown up, using a sharp knife and they still use the skill as adults. The length of this episode, for me, was fine. It’s good to hear from you – Happy New Year! It doesn’t surprise me you’d be an advocate of first aid training but you make a very good point. There are plenty of documented cases of children even younger than 9 years who have saved people’s lives because they had some first aid knowledge. I hope you are having a good start to 2017 and it pans out to be a good one for you. Good video with useful info. Glad you are going to give the Dutch Bushcrafters the possibility to fire different questions at you at he upcoming Bushcraftweekend on January 6-7-8. Could you contact me about that? You have got an email from me. Regards and have a good start of 2017 and a great bushcrafting year! I always appreciate the generous and continuing support and feedback you give me! Without wanting to sound like a broken record (no doubt you have enough messages in one form or another from me to create a book of reviews) but when you create courses that are such high quality, both in content and in the way you convey your knowledge and skill, it makes learning these skills nothing but a pleasure. To anyone reading this and thinking of jumping right in and enrolling on any of Paul’s courses I say do it, grab the chance with both hands and don’t let go. You will be challenged, intrigued, empowered, in awe even with just how much knowledge flows from him. Expect to get fustrated, and annoyed too though, skinned knuckles , stings, cuts and bruises are all part of outdoor life and with challenges will come great reward, much more than if it was just handed to you on a plate.. His courses aren’t a walk in the park. The content is very high level, in depth and will require dedication to truly get the most from it, but you can be completely reassured he will be there by your side through the challenging times. No matter how much commmitment you are able to give at any specific time though, you will learn a huge amount at the other end. The beauty of his on line courses is that you can return to them time after time. I dedicate as much time as I can, but life is life and can get in the way, this isn’t a problem with online courses and you can be obsessive with a specific skill at a pace that suites you. While I was still learning the intricate knowledge in module 4 others were 3-4 modules ahead. That’s fine and that’s why the courses offer so much value for money. They fit in with you. You won’t find a better value or source of information than you will from Paul, no matter where you are on this planet. Warm regards and as always Paul, thank you for all your teachings. Happy New Year Tom. Thank you so much for your kind comments. I hope it’s another good year for you in 2017. Hi Paul, Glad to hear you managed to spend some well earned R+R, and time with your family over the holiday period. Thanks for another generous gift of shared Knowledge and experience. Your answer on what makes a bushcraft knife just that was great.Being just as I would have said; whatever the situation requires. I found this episode as usual made me think about my own knowledge , or lack of in some areas. I shall look on line for a copy of “Eat the Weeds”. It’s good to hear from you. Happy New Year. I’m glad you enjoyed this episode and it was thought provoking in some respects. Another great vid, Paul. Two bits made me smile, your wonderful mini rant and your thoughts about leather belt stuff. As you know I wear a belt with knife, saw and 1st aid kit over my jacket in camp. What made me smile was Ray G pulling my leg about looking like the Polish Colonel from “A Bridge too far” – I will always smile when I put it on now! Happy New Year fella. Happy New Year to you too Phil. That Spey trip was a wonderful week and yes, we had some good times around the campfire, indluding Ray’s observations on your garb. An umbrella is an important piece of kit! Have just bought it, on your recommendation. Happy New Year! Just like to say that I really do enjoy your detailed video blogs! As someone who is 60% deaf, it really helps to SEE your explanations too. This allows me to take in far more information & lip read as necc. Good to see you are passionate about your experience and belief in practical application. Totally agree with you that many folk will have opinions, but without the hands on experience, it counts for nothing in my book! My Father was a Scout Master for many years back in the 50-60’s He was very skilful with his knife but no training offered through Scouts. They should all come on your courses to get a foundation, especially when working with kids. H & S is so important! New year resolution is to get on one of your courses! Due to some health restrictions, I shall contact you privately to discuss. Look forward to meeting you soon. Happy New Year! Just like to say how much I enjoy your video blogs! As I’m 60% deaf it really helps me understand the information better, as I can SEE you talking and lip read if necc. Don’t apologise for being passionate about your craft! Individual opinions are nothing without experience! The advice and guidance you share is invaluable to others, confidence is grown from good knowledge, practice and experience, all of which you have. Thanks for that. My father was a scout Master in the 50-60’s and very good with his knife, but no training through them. I would like to see more organisations who work with groups, getting proper training as a foundation minimum, for Health & Safety and teaching others. My new year resolution is to get on one of your courses! As I have some health considerations its best I contact you via email to discuss further. Really look forward to meeting you in the year. Also, great to see the TREE PERSON’ from Lord of The Rings’ behind you! Lol! Ps: did you put the link to your summer bushcraft show, re course list, required training skills etc? Can’t seem to find it.